Pie? Quiche? Frittata? It doesn’t matter what you call it, this tasty dish is a mid-week dinner winner the whole family will enjoy. 1 Preheat oven to 180˚C. Lightly grease a 20cm cake pan or baking dish with Flora spread. 2 Heat oil in a large fry pan and brown bacon. Stir in Rice and water and bring to the boil. Cover and simmer gently for 10 minutes. 3 Stir well, replace lid and allow to stand for 2 minutes. 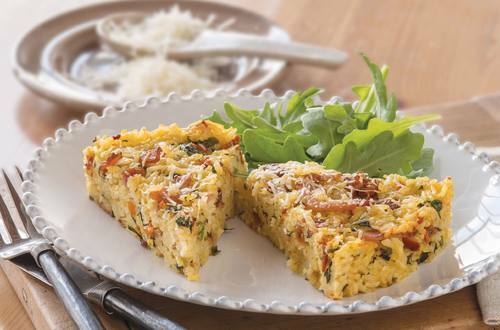 Stir through tomatoes, eggs and basil and pour into cake pan or baking dish. Sprinkle with Parmesan and bake for 25 - 30 minutes until set and golden.